Every week or two, most people in Iaşi will find the latest Supermarket catalogue stuffed in to their post box, whether they want one or not. 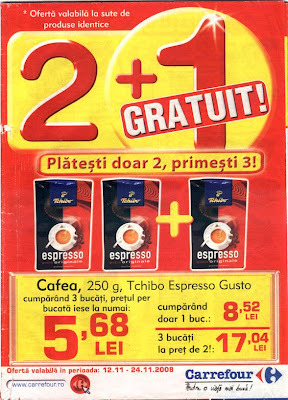 On a 7-14 day cycle, the big retailers publish these free magazines to advertise their latest prices and promotion, like the 2+1 free offer on the cover of Carrefour’s mid-Nov edition. The frequency of the publication reflects the big retailers strategy to shape consumer behaviour: they are trying to educate people to visit the supermarkets more often, because the frequent user will always buy more monthly. Several people related how much they enjoy researching prices. It’s a process similar to that employed by the back-office staff at Carrefour, who monitor the sector from a large magazine wall rack filled with competitors catalogues. People look through their catalogues comparing merchandise and prices, then share the information with friends and neighbours, before choosing to buy the cheaper one. Although sometimes, and this is corroborated by TV and newspaper reports, when they get to the cashier to pay they discover that the price is higher than that advertised. Since Supermarkets arrived in 2003, the big retailers have used these catalogues, loyalty card schemes, allied to media advertising, to help establish a firm grip on the market that not long ago was dominated by small neighbourhood shops and markets. If we are to believe some local research (www.strategy-for-iasi.com), more than 67% of consumers get more than 50% of their day-to-day goods from big retailers. Of these, Carrefour has 28% market share, other big retailers (Kaufland, Billa, G’Market, Metro, Selgros) have 38% of the total market, the small neighbourhood shops have 33% and another 3% come from the traditional markets. Since this research was conducted, the 2nd Carrefour in Pacaurari has opened, probably eating a little more into the 36% share controlled by the small shops and markets.